On Windows 7 and below, I can easily fire up multiple RDP sessions to remote servers. Under Windows 8, when I run RDP a second time, it just brings the first instance to the foreground. How can I launch multiple RDP sessions? I wish to do this with the traditional desktop RDP app, not the new Remote Desktop App from the App store. 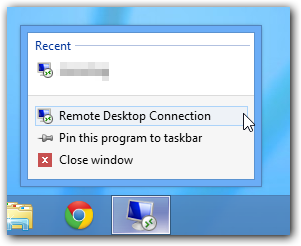 You can click on the taskbar icon with the middle mouse button to open another instance of the Remote Desktop client. Or, right-click the icon and start another instance from the jumplist. Alternatively, you may want to have a look at mRemoteNG, which can open multiple RDP connections in a tabbed interface. Please note that it requires the .NET framework v2 which is not installed in Windows by default (but can be installed through the "Turn Windows features on or off" interface). This "issue" does not affect only RDP, but other applications as well - it's just the way Windows 8 start menu works. Some other options ... In Windows 8, right click the RPD the icon and select "open in new window" Or select "Open file locaton" and pull out a copy of the shortcut "Remote Desktop Connection" to the desktop. Not the answer you're looking for? Browse other questions tagged windows-8 remote-desktop or ask your own question. Can Remote Desktop app on OS X restore sessions after sleep or WiFi outage? How do I run multiple instances of the new Remote Desktop client in Windows 10? How can I change Max Rdp Limits?